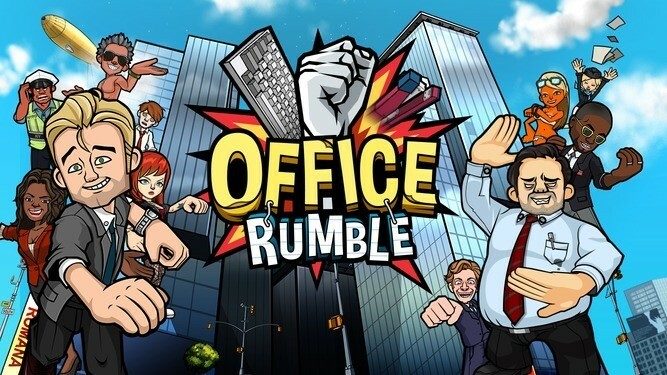 Office Rumble isn’t your usual mobile fighting game. It presents a mundane world, far from fantasy and pits you against people you would hate to meet in real-life. Set in a modern world full of pseudo-liberals, conservatives, uppity socialites and nagging bosses, this game gives you an opportunity to vent your anger on them in a unique way. You fight them in the busy streets of New York, in a subway station or at the office. Like most fighting games, Office Rumble allows users to level-up their employees, equip them with special items and summon friends to beat the hell out of pesky people. You may find these tips and tricks quite handy in case you want battles to be totally one-sided. Defeated opponents will drop a piece of equipment, which could be anything from a pair of jeans to earrings. These items can play a big role in battles, but they need to be upgraded first. To upgrade equipment, tap on Gear and drag-and-drop an item onto a slot on the character profile. Next, select an item and tap on upgrade to boost it. There are different types of slots like Weapon, Food, Vehicles, Tops and Bottoms. Each item has its own advantages and upgrading them will improve your character stats. For example: Upgrading Costume Jewelry Earrings will improve critical hit whereas upgrading a pair of jeans will increase HP. Some items may need gems for a faster upgrade. Just tap on an item and insert a gem that you have received in battle or as a daily reward. You can also sell unwanted gear for extra cash. In the Gear section, tap on an item and then tap on “Select and Sell” button below. I lost twice when I chose to beat opponents manually. Selecting auto mode was a good way to defeat them without losing too much health. Manually fighting opponents can be quite hard as you will need to be extremely quick with your taps to string a chain of hits, create combos or trigger Fever mode. Plus you will need to make sure when to use the special skills. It’s a tough job to do all things at once, especially when the opponent is far quicker than you. With auto mode, the AI does all the hard work for you and knows pretty well when to use skills, when to defend etc. While it does not guarantee a win in harder stages, the chances of winning are more with Auto mode on. Just make sure you upgrade your characters, have all three key elements in your team, and upgrade gear before heading to battle. Use auto mode in 3 vs. 3 battles to increase your chances of winning. Make sure you select a stronger team consisting of high-level, high-grade characters before joining this battle. Office Rumble’s fight mechanics are based on rock-paper-scissors system. Each character is governed by an element. There are five types of elements: Fire, Earth, Water, Light and Darkness. An element is stronger than the other. However, light and dark elements are stronger than each other. A character belonging to light or dark element won’t have any effects on the elements mentioned above. Always have at least three players belonging to three different elements in your team – Earth, Fire and Water. You can choose which character can attack first if you have two or more characters in your team. Use the “Change Order” option if you want to replace your first fighter with a second or third fighter. Having a high-grade, high-level character on the first slot can give you an edge in battle. You can also change the order of fighters via the Change Order option in case the first opponent boasts an element stronger than you. To see what elements your opponents belong to, tap on Start > Act. You will see a list of opponents you will fight. They will be having symbol of an element on top of their profile pics. Now, go back and change the order if you find that the first opponent in the list has an element stronger than your first character. To change order, select the number 2 or number 3 characters on the Home screen and then press the “Change Order” button located on the bottom-right corner of the screen. You will be taken to “Team” where you will need to tap on fighter profile pic to replace him/her with your fighter of choice. You may also switch to another character while battling opponents if you find that the current enemy fighter’s element is stronger than your character. This is something you have done in almost all fighting games on Android. Sacrifice someone useless to make your character stronger. This game also lets you power-up your main fighters. You can use new recruits to make them stronger. Just tap on Power-up, select your main character on the left slot and staff for fusing on the right slot. The power-up success rate depends on various factors. However, chances are more if both fighters belong to the same grade (A, B, C etc). However, powering up a B grade fighter using a C-grade employee will diminish the success rate. So make sure you power-up someone whose grade matches with a staff grade. I am biased towards my A and B grade employees and I want them to get trained (read level-up). The best option for me would be to make them stronger at the expense of other low-grade employees. You too can do it. All you have to do is use C or D grade employees to level-up A and B grade employees faster. You will get plenty of these followers after completing battles. Tap on the Level-Up tab or press the Level-Up button on the character profile. Next, Select an A or B grade character that you want to level-up. Finally, tap on the empty slot to your right to add lower-grade characters. You will need coins to level up, so make sure you have enough money before you try this. Leveling-up has an advantage over powering up fighters. There are no success or failure rates and you can level them up irrespective of the number of cards and grades available with you. You can use any grades, however using spare low-grade characters would be a better choice because you probably won’t need them in your team. Summon friends to fight for you for 15 seconds. Summoning friends can help if your character has taken a lot of beating. On the battle screen, tap on the friend profile button located at the bottom-right hand side of the screen to summon them. During fights, make sure your current fighter’s health does not reach zero. Summon a friend or choose another character as soon as you see his /her health is depleting rapidly. Tag another fighter before your character dies; else you will lose the game. Keep an eye on special skills below each character. Tap on a skill when it gets activated. You can use your fighter’s skill to break your opponent’s string of attacks.